If your dog doesn’t have a thick, plush hair coat consider a winter jacket when temperatures drop below 20°F. 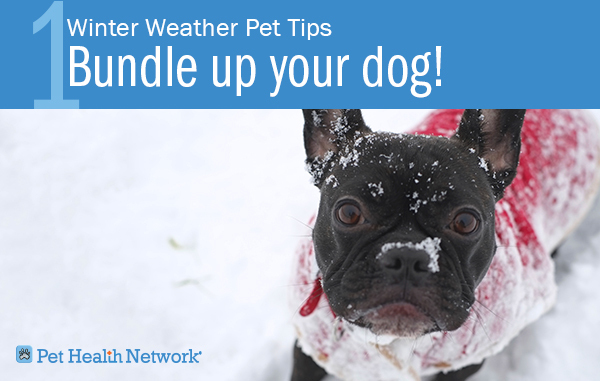 Make sure the jacket is snug and that your male dog doesn’t urinate on the bottom belly strap (which can then worsen frostbite or cold injury). While ice salt is only mildly poisonous to dogs, it can cause irritation to the skin, paws, and gastrointestinal tract when directly ingested. 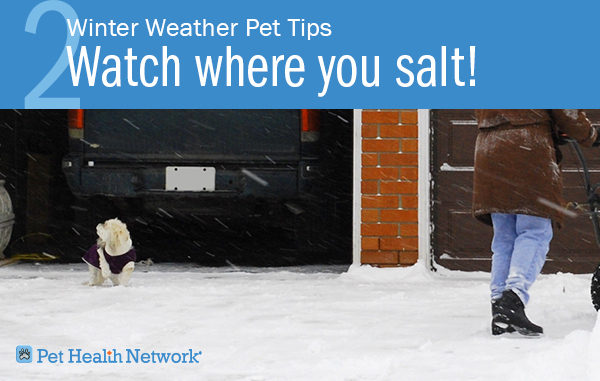 Make sure to use pet-friendly ice melts (which don’t contain salt). More importantly, since you don’t know what your neighbors have put down, make sure to use a damp cloth to wipe off your pet’s paws after coming into the house. There are a myriad of reasons why it’s advisable to keep your cat indoors at all times. 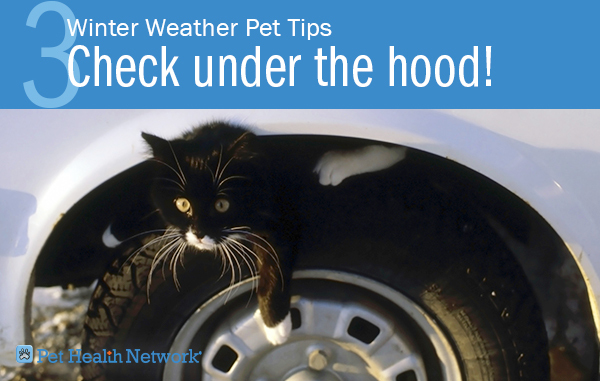 Still, even if you know your cat is in the house, make sure to bang on your car hood before starting the car (this is particularly important if you see paw prints on your hood). Stray cats often hide under a vehicle’s hood when it’s warm and can develop severe fan belt injuries (including broken jaw bones, severe lacerations, etc.) when the car is started. 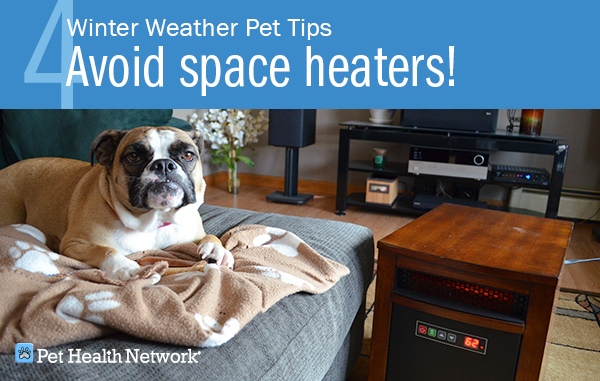 Avoid the use of space heaters, and other sources of external heat, due to the potential for carbon monoxide poisoning, accidental fire, or thermal injury to your pet. 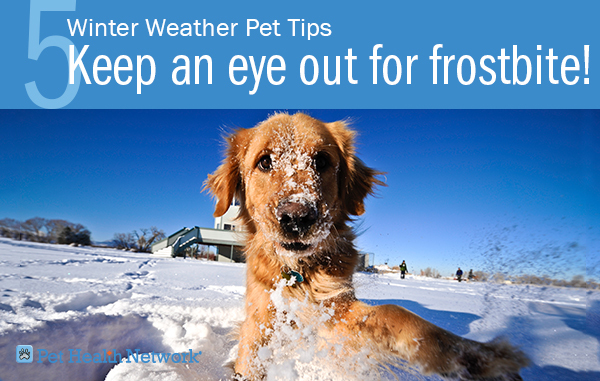 If you do notice any signs of frost-nip (the stage immediately before frostbite) or frostbite, make sure to bring your pet into a sheltered, warm area immediately. Most importantly, avoid touching or actively heating the area aggressively; rather, slow re-warming of the tissue with lukewarm water is best. This will prevent further injury with rapid thawing of the ice crystals in the tissue. Do not rewarm the area until it can be kept warm. Warming and then re-exposing the frostbitten area to cold air can cause worse damage. If no water is nearby, breathe on the area through cupped hands and hold it next to your body. Seek immediate attention from your veterinarian to make sure pain medication, salves, or antibiotics aren’t necessary. Keep in mind that once tissue has undergone frostbite, that tissue is more susceptible in the future.